I am often asked, “What should I feed my English Golden Retriever puppy? What do you recommend?” I have always researched the dog food and looked at the first few ingredients, as I was told that these were the most important and meat should always be the first one. The guaranteed analysis was the next important criteria. We had been feeding Taste of the Wild Dog Food but then we were introduced to Life’s Abundance Dog Food. We were so impressed by the quality and high standards of this dog food and the amazing testimonials from the customers and field representatives of this company that we decided to switch to Life’s Abundance Nutritional System and Agility Formula. Our mission at GoldWynns English Golden Retrievers is to improve the quality of the our breed and offer our customers beautiful, healthy, and sweet-tempered puppies that they can enjoy for years to come. Why You May Ask? Watch This Video Below ! 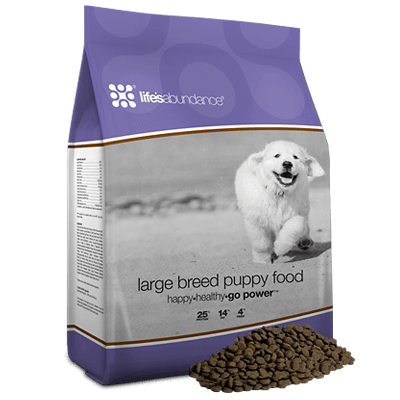 We are now feedings our dogs Life’s Abundance Nutritional System and Agility Formula and raising the puppies on this food supplements to ensure a long and healthy life, as well as provide our puppies a healthy start. It has been demonstrated that the nutrition fed to your English Golden Retriever puppy is responsible for 60% of their future health, like hip dypslasia, skin issues and etc..
GoldWynns English Golden Retriever believes SO strongly in Life’s Abundance Dog Food & Supplements, that we offer a 5 yr guarantee. All puppies that are kept on Life’s Abundance Nutritional System & Agility Formula have our guarantee for the first 5 years of their life. Click here for more details. While this dog food “seems” more expensive up front, the cost is about $1.88 a day for a 70 pound adult dog. Americans spend more than that on their Starbuck’s coffee every morning!!! You feed less dog food, but they receive more nutrition! They are able to digest and utilize the dog food more, which results in less yard cleanup. And you are ensuring a long and healthy life for your pet when you feed them quality nutrition! Isn’t your precious puppy worth it? Watch This Video To Learn More and the Food, Costs and Ingredients!